« What Happens When You Act Against What You Believe? President Reagan’s Secret 702(j) Retirement Plan is yet one more name that the Palm Beach Group has given to the Bank On Yourself method, which relies on a super-charged variation of an asset that’s never had a losing year in it’s 160+ year history. Here’s a spoiler alert: The 702 J Retirement Plan is not an investment and not technically a retirement plan. It’s a specialized type of high cash value dividend-paying whole life insurance that enjoys tax advantages spelled out in IRS Section 7702 of the US tax code. It’s a wonderful retirement plan alternative that has none of the volatility and unpredictability of traditional investing strategies. So why didn’t The Palm Beach Group call it a “7702 J plan” instead of a “702 J plan”? Because that way you won’t be able to find out what it really is! Section 702 of the tax code refers to something else altogether. The Palm Beach Group’s main goal is to get you to pay for information that’s available for free elsewhere. The 702(j) Retirement Plan – which Palm Beach Group also calls the 770 Account, 501(k) plan, and Income for Life – is most commonly known as a “Bank On Yourself plan,” and we’ve been educating the public about it since 2002. Palm Beach is the latest group to jump on the Bank On Yourself bandwagon. And the reason Palm Beach Letter keeps changing the name of this strategy is to create mystery. This article explores what they got right about this strategy… and what they got wrong. You see, Palm Beach Letter is part of a highly successful publishing company that puts out subscription-based investment newsletters. Get instant access to our FREE 18-page Special Report, 5 Simple Steps to Bypass Wall Street, Fire Your Banker, and Take Control of Your Financial Future, plus timely briefings and solutions to critical news and events that may impact your money and finances. “Subscription-based” is code word for the only thing you get for free is hype and mystery. To get any real details or actual meat, you gotta pay for it. Some of their publications and advisory services cost up to $5,000 each, so getting you hooked on paying for their information is a top priority for Palm Beach Letter. And since you can get all the details you’d ever need to know for FREE right here on this Bank On Yourself website and in our ezine, Palm Beach Letter needs to make sure you never connect the dots. 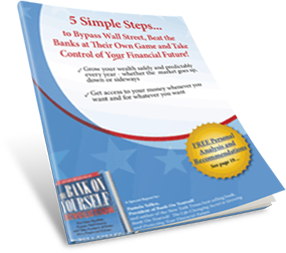 Start by downloading our FREE Report, 5 Simple Steps to Bypass Wall Street, Fire Your Banker, and Take Control of Your Financial Future, right here. It reveals all the details about the 702(j) Retirement Plan that Palm Beach Letter makes you pay for. Palm Beach Letter can afford to spend BIG money on top copywriters and massive marketing campaigns. But at some point, an advertising campaign goes stale. And that’s when Palm Beach Letter hires another copywriter and tells them to dream up a new, mysterious-sounding name for this strategy. I wrote about an earlier name Palm Beach Letter gave to this strategy – the 770 Account. And in that post, I explain three critical things Palm Beach got wrong about it, and one thing they got right. Some of what Palm Beach Letter got wrong is SO serious that it will undoubtedly cause the various state insurance departments and commissioners to knock on Palm Beach Group’s door, if they haven’t already. One example is that this strategy relies on specially-designed dividend-paying whole life insurance policies, and in most states it’s illegal to call a life insurance policy a retirement plan. I encourage you to read my post about the 770 Account here. But here I’d like to point out a few additional things Palm Beach Letter got wrong in their sales letter for the 702(j) Retirement Plan. There is NO such thing as a 702(j) or 770 account! But there’s no code named 770 or 702(j) that relates to the tax status of life insurance policies. (And Section 702 relates to something else altogether.) It’s actually IRS Section 7702 that relates to this, and it was added to the tax code by the Deficit Reduction Act of 1984. Which just so happened to be while Ronald Reagan was President. Palm Beach Letter uses “770” and “702(j)” as red herrings, so you can’t just search online and find out that it applies to cash value life insurance. They hope you’ll be so curious that you’ll pay them to get the details. Devilishly clever… and deceptive, don’t you think? Because at Bank On Yourself, we believe in being transparent, here is a link to the details of IRS Section 7702. As I explained here in my post about the 770 Account, Palm Beach Group doesn’t understand how the guaranteed growth of your cash value is calculated. That’s not true, although it is true that when you include the dividends, the return can be substantial. I encourage you to watch this video that shows an actual policy issued nearly 50 years ago and then walks you through how you would have to get a 9.94% annual return in a tax-deferred 401(k) or IRA to equal it. However, since every plan is custom-tailored, your numbers will be different. To find out what your guaranteed bottom-line numbers and results would be if you added this safe, predictable wealth-building strategy to your financial plan, just request your FREE Analysis here. Here’s another thing I take issue with: Palm Beach Letter lists many politicians and well-known people who have owned whole life insurance plans. However, I have documented all of my sources for that information. Palm Beach Letter thinks you should just take their word for it – another example of lack of transparency. They tell you if you pay them money, they’ll give you the contact info for the advisors they recommend you use to set up your 702(j) plan. But one of their highly touted “experts” wrote a book which advises clients to take retirement income from the policy in a way that can cause the policy to lapse, creating a big tax liability. It also results in less cash value over time. That should give anyone pause. The Bank On Yourself Authorized Advisors receive vigorous training on this and would never recommend such a risky strategy. They really spent enormous amounts of time and money investigating this strategy and have concluded (as I have) that it is an amazing safe wealth-building tool that has stood the test of time. And because they can afford a massive advertising campaign, they have given the concept even more exposure and credibility. But if you want the real FACTS about this concept, you’ve come to the right place. Learn more about Bank On Yourself (a/k/a the 702(j) Retirement Plan) when you download our FREE Report, 5 Simple Steps to Bypass Wall Street, Fire Your Banker, and Take Control of Your Financial Future. No two Bank On Yourself plans are alike – yours would be custom-tailored to your unique situation, goals and dreams. To find out what your bottom-line numbers and results would be if you added Bank On Yourself to your financial plan, simply request your FREE, no-obligation Analysis today. You’ll also get a referral to one of the Authorized Advisors who can answer any questions you have. So why would I believe Bank on Yourself? Aren’t they all gimmicks anyway? I suppose you might think that if you’ve been hiding under a rock, or have your mind made up – regardless of the facts. Here’s proof that Bank On Yourself is legitimate. building power of properly built insurance. HOW DO i GET A COPY OF THIS REPORT? I am writing you to say how thankful I am to find your site. I have bought/subscribed to Palm Beach and paid for the subscriptions to get the 770 Account and 702(j) because I thought they were two different things. My goodness, do they have to hype us that much? All the while you are the real genius and woman behind this blessing since 2002. I tried buying your book but for some reason it didn’t push through. I will try again tomorrow and get your two books this time. The thing I luv about the Palm Beach ais that they say Al Capone and FDR had these accounts…even though they were long dead before the Tax Reduction Act of 1984…. I don’t like money making opportunities that are mysterious. At least my retirement money in the bank is insured and although it doesn’t make high interest, I am not risking to lose it. The question about 702 account is that somehow it is like a secret and there is a chance that you could lose your money at anytime. Did not mention on any insurance of accounts. The regular bank account is at least insured with the limit of $250,000.00 total on an account. So what if you really do not have a whole lot to begin with. Is this something that would work for someone with very little to start off with? Is there a minimum amount that a person would be able to invest and start off with? The best way to find out is to request a FREE, no-obligation Analysis at https://www.bankonyourself.com/analysis-request-form. I have been reading your information for awhile now, and, I find it very very factual and well worth the time it takes to read it. As an insurance agent and consultant, I will surely provide your name to my clients, because they need to know what you are saying! I will myself be taking advantage of this information, which will aid me in my business as well. Most importantly, THANK YOU for clearing up the deception of Palm Beach, because I got the book “The 702j Retirement Plan, but I quickly cancelled my subscription because when I read something and it sounds too “vague”, then I know something is not quite right! You substantiated that for me by providing that information on your site! Much obliged! Thanks for your vote of confidence, Thomas, and for the good work you are doing for your clients. If you have a strong interest in helping your clients implement this safe wealth building strategy, please be aware that we are currently looking for Advisors who want to become Bank On Yourself Authorized Advisors, and receive the advance training and support provided to those who qualify. Several years ago, we cashed in our whole life policies because they were NOT performing like they had been projected to perform. We are now without life insurance, so if this is so great…..do we have to purchase a whole life policy and since we are both age 70, would it even be worth the cost? We have checked into some policies and they are outrageous. Wandamurline did they give you an answer, i am in the same boat too. Looking forward to this answer and waiting to read the downloads to make my mind up. If you are interested in this strategy and would like to find out if you qualify for it and how you could benefit from it, given your unique goals, circumstances and dreams, why not take advantage of a no-obligation Bank On Yourself Analysis that will help you get those answers? You can request it online by going here.